On October 16, the national memorial for Martin Luther King Jr. will be officially dedicated. The event was rescheduled from August due to Hurricane Irene. Because schools are back in session, the original attendance estimate of 250,000 has been lowered to 50,000. The four-acre park has been open to the public since August. The site of the memorial is along the Tidal Basin in Washington, DC, between the Lincoln and Jefferson memorials. It is the first memorial for an African American within the National Mall and the first major monument for someone other than a president. King’s “I Have a Dream” speech provides the inspiration for the park’s design. The 30-foot statue of King shows him emerging from a block of stone, a reference to his hope for “hew[ing] out of the mountain of despair, a stone of hope.” Fourteen more quotations from other of King’s speeches are inscribed along a 450-foot wall. The address of the memorial is 1964 Independence Avenue, a reference to the Civil Rights Act of 1964. The design of the memorial has stirred some controversy. One criticism is that the sculptor is Chinese, and the stone used is from China. Critics also say that one of the most prominent inscriptions misrepresents King’s view of his role within the civil rights movement. The controversial inscription reads, “I was a drum major for justice, peace, and righteousness.” It is a paraphrasing of a longer passage in which he theorized about his possible eulogy. Detractors believe that the rewording gives King a sense of arrogance that he did not possess. The designers of the project, however, stand behind their decision to shorten the quotation in order to make it more prominent within the space provided. Despite the controversy over the design, many visitors to the site feel that it is an important and moving reminder of the accomplishments of Dr. King. Learn about the building and dedication of the memorial. 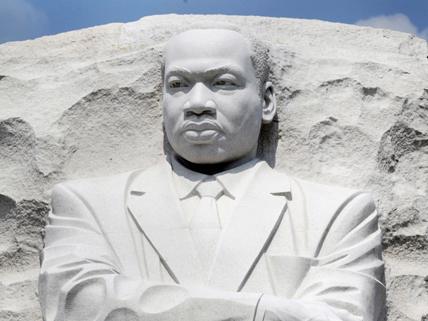 This site includes a time line of events in MLK’s life and the process of building the monument, plus descriptions of the meanings behind various design elements. Explore the controversy over the MLK memorial and view examples of other memorials whose designs caused disagreement; includes slideshow of the new monument. Watch video footage showing views of the memorial and interviews with members of the public expressing their reactions and opinions about the memorial and Martin Luther King’s achievements. National Mall & Memorial Parks in Washington, D.C.
View maps of the National Mall showing locations of the many national memorials and monuments in Washington, D.C.
its so nice to see a black man being remebered but it took a long time……. I think its very inspiring to have and african american person that is not an president being recognized for his hard work,great achievements,and wonderful citizenship thank you Martin Luther King for everything r.i.p . I Think It Is Very Important To Have An African American As A Monument . People Will Look Up To Him As A Great Leader And Will Never Forget Him . I think this picture is really cool.But I also know that he was a brave man.in many ways in life. i didnt even know this was happening. but its good to know that it is now, because what that man did for our country was GREAT!!!! hats off for mr. king. wow! it is a lot of things about martin luther king jr. it is a lot of interesting things about him. i know that many people wish that he was alive because we know we do!!! now we have to go !!! HE DID SO MUCH TO HELP OUR COUNTRY ALOT OF PEOPLE LOVED HIM BEFORE DEATH R.I.P. That is a legacy worth having.. great man with a greater dream. HE IS THE KING OF THE WORLD 😀 ! I’m not sure I am with you on that. I take it you’re thinking of the renect spate of released and announced Hollywood adaptations of anime/manga titles? (There’s no American connection in these Evangelion films, at least not so far as I know.) While it’s true that most Hollywood remakes of foreign films are ill-advised and/or dreadful, they’re not _all_ bad and I’m not hostile to cross-cultural remakes per se. More broadly speaking, there’s no shortage of great films from many countries’ cinemas that owe a great deal to cross-cultural artistic currents. To bring it back to specifics, I am intrigued rather than off-put by the idea of an American Cowboy Bebop; the heavy Western art influences on that series make it potentially a great fit for the Hollywood treatment. I guess what I’m saying is that I’d rather take the remake issue on a case-by-case basis. In other words, if the Cowboy Bebop adaptation turns out to be a terrible film that fulfills fans’ darkest forebodings, then it will only prove that this version by these people was terrible, not that an American version should never have been attempted. Why did they give a memorial for him? I HAD A DREAM! last night, it was about tacos. had a dream i was king i woke up still king. martin luther king jr.was a great man yes indeed he helped all of us i had a dream that chicken would always be fried yummmmm……..
ya man this is soooo tight!!!!! i luv it i luv it man ya!!!!!!!!!!!!!!!!!!!!!!!!!!!!!!!!!!!!!!!!!!!!! Ihh Honestlyy Respectt Martinn Lutherr Kingg Becausee Hee Stoodd Upp Forr Hiss Counrtyy ! Andd Toldd Peoplee Whatt Itt Wass Andd Howw Hee Feltt Aboutt Thee SATIUATIONN Andd All due respect thanks for what you did todayy martinn RIP ! Pretty nice post. I just stumbled upon your blog and wenatd to say that I have truly enjoyed surfing around your blog posts. After all I will be subscribing to your rss feed and I hope you write again soon! good thing they did that so i can tell my kids thats a strong black man. He was an amazing man. Seriously he was. I show respect to what he did by studying and not taking advantage of the freedom he gave us, instead of spelling like some children. Spell better people. I don’t care if it’s the internet. Show Respect. Rest In Peace Martin Luther King, Jr.